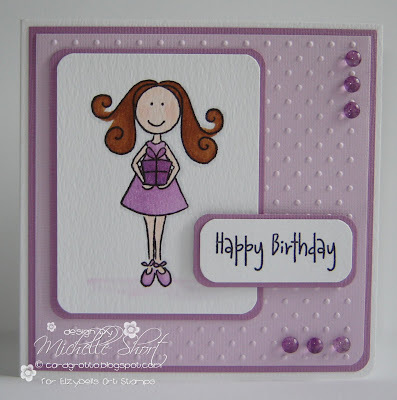 This card is made using the gorgeous Birthday Girl stamp from Elzybells. I have stamped her out and coloured her in with Copic markers then mounted her to mauve CS and added to base with DST, the corners rounded with a corner rounder punch. The base has been made by layering mauve CS on to white card blank then adding a layer of light mauve which has been put through my Cuttlebug using the Swiss Dots embossing folder. I have then stamped the greeting seperately and mounted to more mauve rounding the corners, this has been addded with 3D foam pads to the card. I have then added Dew drops to the corners to finish. I really like how this card came out in the end! STAMPS: Elzybells Art Stamps. INK: Airondack Pitch Black. CS: Craftwork Cards, Bazzill Basics. ACCESSORIES: Swiss Dots embossing folder, Woodware corner rounder punch, Robins Nest Dew Drops, Copic markers.